Founded in 1992, Aussie Bodies has been at the forefront of Australian supplements, with the brand now readily available at pharmacies and supermarkets. While it may not have the international reach of other protein supplement brands, Aussie Bodies offers bars, drinks and powders for fitness enthusiasts to try. If you’re looking to make a health change, read on to find out what Aussie Bodies has to offer. 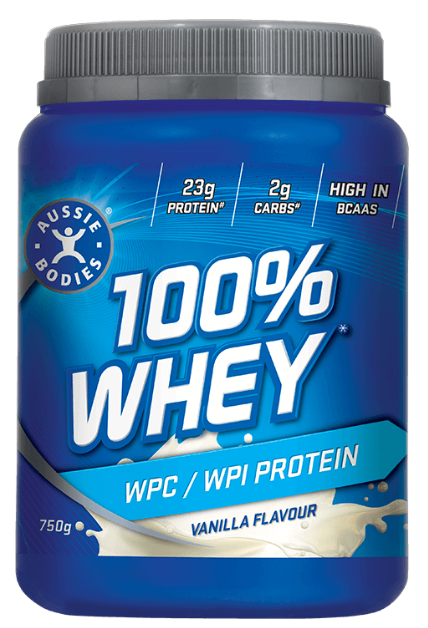 Aussie Bodies offers a number of powder options, including plant proteins for those keeping to a vegan diet. 100% Whey Muscle Recovery: While it may not be the type to stock up on if you’re after variety – with the Whey Muscle Recovery only available in vanilla and 750g tubs – each 30g serving contains over 23g of protein and only 2.2g of carbs, making it a worthwhile option for those looking to get the most out of their protein. Including additional amino acids for recovery, the Whey Muscle Recovery is for those more serious about their fitness. Perfect Protein Natural Whey Protein: Made from natural ingredients, Perfect Protein is also gluten free, making it ideal for those with allergies. Available in both 375g or 3kg tubs, Perfect Protein is also available in both vanilla and chocolate flavours, and provides over 27g of protein per 35g serving. Perfect Protein Natural Plant Protein: Aussie Bodies’ vegan friendly option, the Natural Plant Protein is available in a 375g tub, coming in both vanilla and chocolate flavours. Made from pea protein isolate and natural sweeteners, the Plant Protein provides just under 22g of protein per 30g serving, with under 1g of fats and under 2g of carbs, making it a handy option for those on a strict diet. Perfect Protein Real Fruit Smoothie Powder: If protein shakes aren’t your thing, or you’re just after something other than chocolate or vanilla, the Real Fruit Smoothie Powder may be the option for you. With probiotics, digestive enzymes, fibre and additional vitamins and minerals, the Real Fruit Smoothie Powder comes with 18g of protein per 40g serving, with over 10g of carbs as well. While not the option to turn to if you’re looking for a big protein hit, it may be well worth exploring if you’re new to protein supplements, with the Smoothie Powder coming in a strawberry and pomegranate flavour, but is only available in a 400g tub. Protein powders and shakers aren’t always easy to carry around, but thankfully there are other ways to get your protein hit if you’ve left your shaker at home. Aussie Bodies is one of many brands that offers protein bars for those on the go, whether you’re after a bit protein hit or something lower in carbs. If you’re interested in how Aussie Bodies protein bars compare to competitors, check out our protein bar comparison table. Arvo Protein Bar: Marketed towards those who suffer a bit of brain-fuzziness after lunch, the Arvo bar may be a handy option for those looking for a protein hit while soothing their sweet tooth. Containing just under 10g of protein per 32g serving, and containing just over 3g of carbs, the Arvo protein bar is available in both peanut toffee and almond caramel flavours. Lo Carb Protein Bar: Arguably Aussie Bodies’ most popular bar, the Lo Carb bar is available in a variety of sizes and flavours, including choc caramel, rocky road, peanut butter caramel as well as choc honeycomb, and comes in 30g or 60g individual bars, or in packs of 4. With only 8.5g of protein per 30g serving, the Lo Carb bar may not be the one to grab if you’re serious about putting on muscle, but may be a good starting point if you’re not sure about protein bars. HPLC Bar: One of the largest bars available, a HPLC bar – which stands for High Protein Low Carb – weighs in at 100g per bar, and contains 45g of protein per serving, with only 4g of carbs. With almost 13g of fats however, you may want to steer clear if you’re watching your weight. Readily available in chocolate or cookies and cream, the HPLC bar may be worth it if you’re hungry, or looking for a good chunk of protein. ProteinFX: While only available in a 65g chocolate bar, the ProteinFX includes just under 20g of protein per serving, as well as over 23g of carbs, making it an ideal for those looking to go big in their workouts. 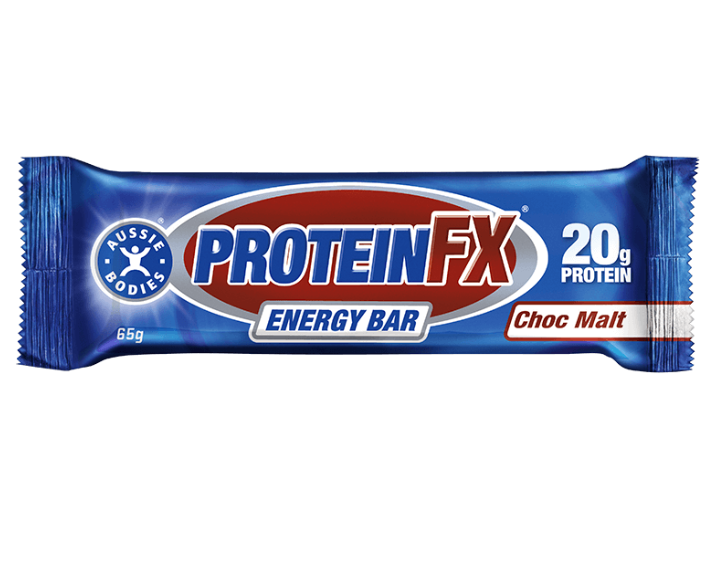 If that sounds more your speed, Aussie Bodies also offers the ProteinFX Super bar, which includes just under 26g of protein and 18g of carbs per serving, handy for those watching their nutrient breakdown. Lo Carb Protein + Fibre Bar: Packing a bit more of a protein hit than the traditional Lo Carb bar, the Lo Carb with fibre bar is available in plenty of flavours, including honey almond, blueberry almond, coconut and lemon, cranberry almond as well as rocky road. With 14g of protein and almost 5g of fibre per 40g serving, the Lo Carb fibre bar may be checking out if you’re looking to improve your gym sessions, as well as body functionality. If protein bars aren’t your thing, or you’ve run out of protein powder and need a protein hit, Aussie Bodies also offers a number of ready to drink options for gym goers. Lo Carb Lean Protein Shake: Coming in chocolate and vanilla flavours, the Lo Carb Shake is available in a 375ml bottle, with over 30g of protein per serving. With over 17g of fibre per serving also included, the Lo Carb shake may be a handy option if protein powders aren’t your preference. 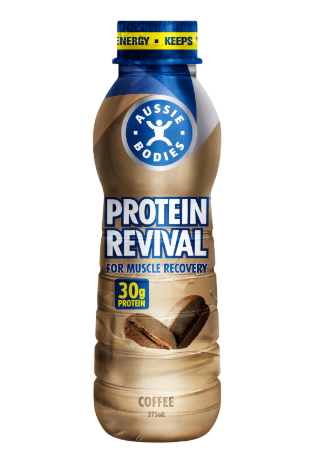 Protein Revival Protein Shake: Available in a 375ml serving, the Protein Revival range includes flavours such as chocolate, coffee, strawberry, coconut and vanilla, with over 30g of protein per serving. You’ll have to be careful though, as it also includes just under 30g of carbs per serving, meaning you might want to avoid if you’re looking to slim down. Perfect Protein Real Fruit Smoothie: A viable option for those not looking for traditional shakes and powders, the Real Fruit Smoothie is similarly available in a 375ml bottle, and comes with over 30g of protein per serve. Despite the protein hit, it does also contain over 12g of fat and 20g of sugar, meaning it may not be the best option for those looking to stick to a diet. Available flavours include raspberry and blueberry, mango, banana and passionfruit as well as strawberry and pomegranate. Aussie Bodies does not sell any of its products online, instead opting to sell through supermarkets, supplement stores as well as select pharmacies, with its website outlining which retailers to target if you’re after a specific product. Should I choose Aussie Bodies protein supplements? The world of supplements can be a confusing one, particularly if you’re looking into it for the first time. With plenty of brands and supplement types readily available, it’s best to look into all your options to find the best fit for your lifestyle and diet. If you want to bulk up on your supplement knowledge, head over to our protein supplement ratings to see just what each brand has to offer.